I have not run since secondary school in the mid-eighties, and definitely not since I tore my left knee ACL and meniscus in 1989. 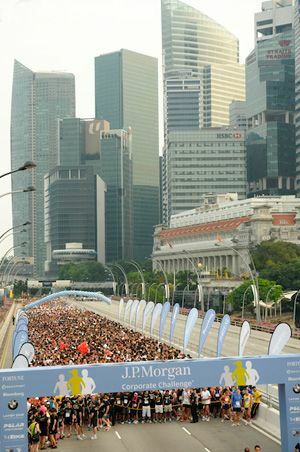 But when my NetApp colleagues suggested that we form a team for the 8th annual J.P. Morgan Corporate Challenge in the Lion City, I decided to give it a shot with a disclaimer - that I would be (brisk) walking. So 11 of us formed Team NetApp. Race day - what a great atmosphere! A record 13,233 participants from 403 companies were flagged off in a cool but humid evening. I was at the back of the pack, and the queue was so long that I only started about 20 minutes after the elite runners started. Surprisingly, perhaps because of the atmosphere, my run/jog/walk was not as painful as feared. I managed to jog most of the 5.6 km street course, and walked through a couple of bottle necks. I finished 7903th position in 49:38 minutes ... and with no reference point, I thought this was a good finish. It was certainly the longest I have run for over 25 years! A few of us adjourned to Durty Nelly's Irish Pub for drinks to celebrate the completion of a great event. Great company, no injury or major pain - I would probably do it again next year. The leader of my regular mountain biking gang, Chris de Souza was featured in the news. The main photo was from our annual pilgrimage to Chiang Mai, Thailand.